The idea began with a late night conversation between two men who had just met. Walt Disney, creator of Mickey Mouse and the entire Disney empire, was visiting his boyhood hometown of Marceline for the dedication of a park and swimming pool named in his honor. The town fathers didn’t want their favorite son to stay in a hotel in nearby Brookfield so they asked local businessman Rush Johnson if he would host Disney at his home, one of only three in Marceline that had central air conditioning in 1956. After everything was over he and I retired to our den, Johnson recalls of his first meeting with Disney about something that would become known as The Marceline Project. First thing he asked me was ‘Rush, who owns the farm?’ I told him and he said, ‘You can buy it cheaper than I can. Buy it. And so began ausiness relationship that lasted until Disney’s death 10 years later. With Johnson’s help Disney bought his father’s old Marceline farm and the land adjacent to it. The family farm was the inspiration for many of Disney’s early cartoons and he wanted to share his experiences with others. Long before others saw the need Disney imagined a living history farm where young and old could relive a simpler time and discover their roots. He was such a visionary, says Kaye Malins, Johnson’s daughter and the current president of Disney’s childhood home. He said there will come a time when a child will not know what an acre of land is. There will come a time when a child will not know what happens when you put a seed in the ground. We’re there now. Disney’s idea for a park recreating his family’s farm faded with his death in 1966. Through the years, Marceline has attracted thousands of visitors but little has been done to adequately honor its most famous citizen until now. Beginning with a new museum dedicated to Disney and the Sante Fe Railroad that was so dear to him, the north-central Missouri town is staking its future on its Disney past. While the living history farm is still a dream, the museum is well on its way and will house temporary exhibits in time for a celebration of Walt Disney’s 100th birthday, Sept. 21-23. The three-day event is the first of many projects locals say will someday fulfill Disney’s dream for Marceline. Disney spent just five years in Marceline but they were formative years. The family moved to Missouri in 1906, when Walt was just 5. He later said, More things of importance happened to me in Marceline than have happened since, or are likely to in the future. It was here that Disney began to draw and even sold his first artwork, a picture of a Morgan horse that earned the young getting dumped in the mud, being chased by a bull and other boyhood adventures found their way into his cartoons. Even the design of Disneyland’s Main Street USA is based on downtown Marceline. Despite Disney’s love for Marceline it would be 46 years before he would come home. Although locals tell tales of clandestine visits, Disney’s first known return was the 1956 park dedication. 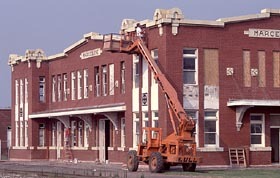 Later that year he and his brother and business partner, Roy, held the Midwest premiere of his movie The Great Locomotive Chase at Marceline’s Uptown Theater. 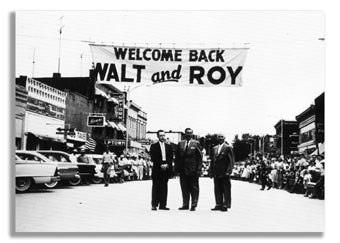 Walt and Roy stood outside and greeted every child that went into the theater, recalls Malins, who attended the premiere as a child. When Walt took the stage that day he said, ‘You children are lucky to live in Marceline. My best memories are the years I spent here. In 1960, Disney visited again for the dedication of Walt Disney Elementary School. 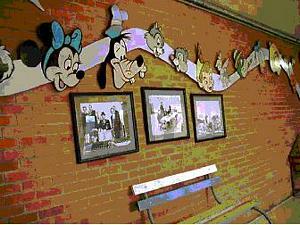 Not only did Disney cancel an overseas trip in order to attend, he also had his studio create one-of-a-kind murals which adorn the school’s lobby and gym to this day. When Disneyland retired its Autopia kiddie-car ride Disney planned to attend the ceremony marking the ride’s new home in Marceline’s Walt Disney Park. At the last minute he cancelled, complaining of a cold he could not shake. The cold turned out to be cancer and Disney died within the year. Today thousands of tourists travel to Marceline to see where the magic began. They arrive in tour buses or straggle into town alone to visit the important places of Disney’s youth and the spots he visited during his homecomings. Townspeople primarily schoolchildren trained as Disney Ambassadors provide guided tours or visitors may pick up a map and take a walking tour on their own. Two Disney Ambassadors display a Main Street USA sign during a tour of Marceline. The high school students and volunteer tour guides explain that Marceline’s downtown provided the inspiration for Main Street USA at Walt Disney’s theme parks. 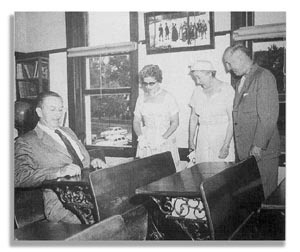 Walt Disney discovers the initials he carved in his grade school desk. This month, the town honors its favorite son during a 100th birthday celebration. Local residents have purchased Marceline’s Sante Fe Railroad depot and are restoring the building which will house a museum honoring one-time Marceline resident Walt Disney. 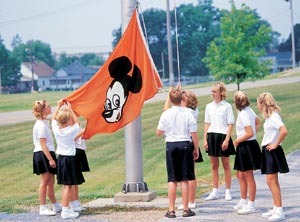 School children from Walt Disney Elementary School raise the Mickey banner in front of the school. The flag was a gift from Walt Disney and featured colors and a design which only flew over the school and Walt’s personal apartment. This is the only place outside of Disneyland authorized to fly this flag.